Gaius Julius Caesar was a Roman politician and general who played a critic role in the events that led the rise of the Roman Empire. Caesar rose to become one of the most powerful politicians through a number of is accomplishments, notably his victories in the Gallic Wars. After assuming control of the government, Caesar began a program of social and governmental reforms, including the creation of the Julian Calendar. His populist and authoritarian reforms angered the elites, who began to conspire against him. On the Ides of March 44 BC, Caesar was assassinated by a group of rebellious senators led by Gaius Cassius Longinus, Marcus Junius Brutus, and Decimus Junius Brutus. 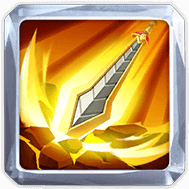 For the next 5 seconds, increase troops’ attack and defense and increase all damage. Reduces damage taken by Caesar’s troops by [x]%. 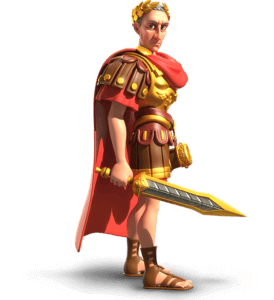 When Caesar’s army has been reduced to 60% or less of his units, he has a 10% chance to further reduce damage taken for the next 3 seconds whenever his troops are attacked. The effect can only trigger once every 5 seconds. Caesar has a 10% chance to reduce enemy defense by [x]% per turn when attacking other Governor’s cities. The effect lasts for 3 seconds. Increases the maximum troops capacity by [x]%. Deals direct damage (Damage Factor 400) to the target, and, for the next 5 seconds, increases troops’ attack and defence by 20% and increases all damage by 30%. Top 5 General Tips For A Better Start! Rise of Kingdoms Copyright © 2019. This is a fan site and it is not affiliated with Lilithgames in any way.